Reasoning Ability is an onerous section. With the increasing complexity of questions, it becomes hard for one to give it the cold shoulder. The only way to make the grade in this particular section in the forthcoming banking exams like IBPS PO is to practice continuously with all your heart and soul. 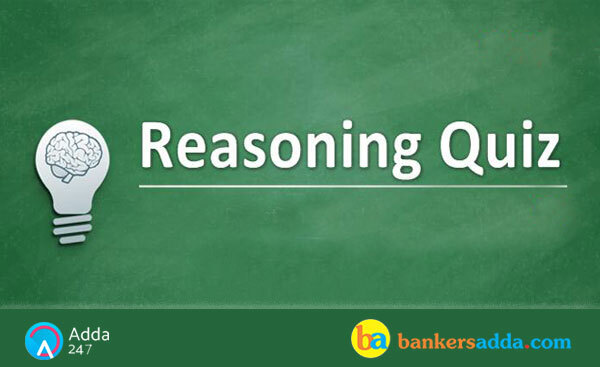 And, to let you practice with the best of the latest pattern questions, here is the Adda247 Reasoning Quiz based the exact same pattern of questions that are being asked in the exams. There are eight persons namely- P, Q, R, S, T, U, V and W sitting around a circular table facing the centre, but not necessarily in the same order. Each person belongs to different states i.e. Andhra, Bengal, Bihar, Sikkim, Punjab, Rajasthan, Kerala and Karnataka and also likes different colours viz. - Red, Blue, Yellow, Orange, Purple, Violet, Pink and Black, but not necessarily in the same order. The person who belongs to Kerala sits second to the right of S, who belongs to neither Rajasthan nor Punjab. U sits second to the right of the one, who belongs to Rajasthan. The one who likes Purple sits second to the left of the one, who belongs to Bengal. Two people sit between the one, who belong to Punjab and Q. T belongs to Bengal. S likes pink. V and the one, who belongs to Sikkim are immediate neighbours of each other. Persons who like Orange and Violet are adjacent to the one who belongs to Sikkim. The person who likes Orange sits immediate left of the one who belongs to Bengal. Q does not like Pink and Black. The one who likes Black sits second to the right of the one who likes Pink. R and T are immediate neighbours of each other. Neither R nor T is an immediate neighbour of both Q and the one who belongs to Rajasthan. Q does not belong to Sikkim. The one who belongs to Bengal sits second to the left of the one who belongs to Karnataka. Person who likes Yellow sits fourth to the right of the one who likes Blue. The one who likes Pink is not an immediate neighbour of the one who belongs to Rajasthan. P likes Black. Only one person sits between R and the one who belongs to Andhra. W doesn’t like yellow and sits third to the left of the one who belongs to Bihar. Q1. What is the position of Q with respect to the one, who belongs to Bengal? Q2. Which of the following colour does Q like? Q3. Who sits opposite to P? Q4. Four of the following five are alike in a certain way and hence they form a group. Which one of the following does not belong to that group? Q5. U belongs to which of the following state? I. All bikki being neeraj is a possibility. II. No bikki is a panda. If either conclusion I or II follows. If neither conclusion I nor II follows. I. At least some roshan are raj. II. All raj being rohit is a possibility. I. Some plants are table. II. Some trees are chair. No mango is a banana. I. Some guavas are mango. II. No guava is a papaya. I. Some bananas being mango is a possibility. II. Some papayas are guavas. Q11. Which of the following is the code of ‘Theory’? Q13. Which of the following may represent ‘logical idea is only order’? Q14. Which of the following is the code of ‘logical’? Q15. Which of the following is code of ‘serial’?